Happy Hump Day! WOW, saw pictures on the news this morning of the Tornado's in the US, what is going on with our weather!!! So much destruction in just a few minutes. My thoughts and prayers go out to the people affected by these severe storms. Today's card is for the Challenge at Sassy Cheryls, # 104, theme, Seeing Spots. everyone has had one and has had a hard time getting rid of it! 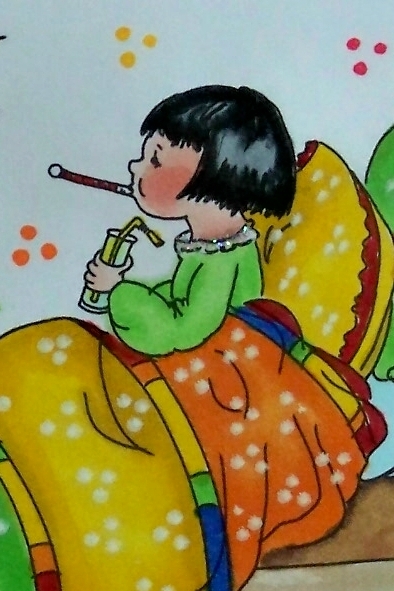 Mild winter, a lot of air born germs! Die Cut for image, Spellbinders, Die for swirls, Cheery Lyn. Great coloring! So bright and cheerful! This would cheer anyone up!!! That's a cute image and I'm loving the bright cheery colours. Yeah, how about that weather. Weirdest thing ever to have snow storms along with our tornado warnings. Hope things are a bit more consistent up in the Buffalo region!! Sue what a sweet card. Nice and bright. what a cheerful card sue this is a card you get better from. What beautiful coloring. You get an A+ for staying in the lines. Whew, that was a job. 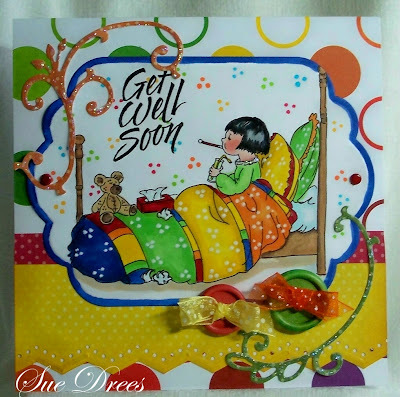 Love the bright cheeriness of this "Get Well" card. Our pollen has begun to fall and everyone is feeling the effects. Yuck! Poor little Sick Sally! This is a gorgeous card. Love it. Thanks for playing in the Spots & Dots challenge this week at Sassy Cheryl's. So glad you could join us! Absolutely too sweet! Your coloring, as always, is amazing! oh my...this colorful card would make anyone feel better Sue! Love it! poor thing, seeing lots of spots!! so cute!!! GORGEOUS bright rainbow colors. Fabulous and happy design to go along with that sweet image.